A lot of people will instantly recognise this slot by Microgaming. 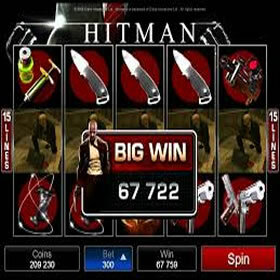 Hitman was originally a video game by Eidos Interactive and the platform is still popular to this day. 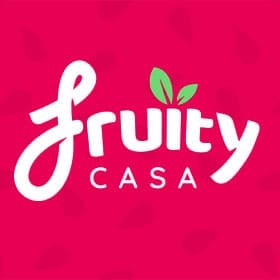 There are jackpots to be won and bonus rounds to be enjoyed too so we thought we would head over to Fruity Casa and have a few spins of this game. It certainly looks the part and will definitely remind fans of the franchise of the original video game. 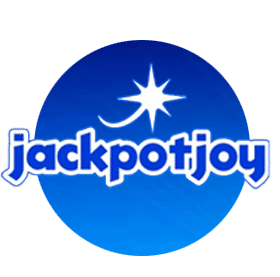 There is a whopping 4000X base game jackpot up for grabs and players will enjoy the bonus rounds which trigger from time to time so there really is plenty of depth to this game. In terms of design, Hitman looks pretty violent with a blood red background and lots of objects making an appearance on the reels. This game is not for the faint-hearted and players will encounter a number of items including a deadly syringe, a sniper rifle, pistols, a garrotte, a knife and much more. 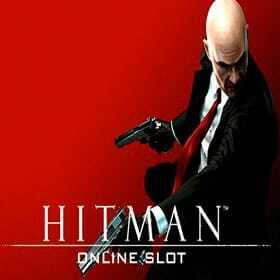 Hitman makes an appearance from time to time and the controls are easily located at the base of the game. The sound effects are pretty cool but you can turn them off if you wish. There are also some bonus symbols which trigger the main features. The first is the wild symbol and it is the Hitman with two crossed pistols and it replaces all others on the reel except for the three scatters. The wild can expand every now and then to create some big wins. You’ll get an animation of Hitman walking off through a door when this happens which is pretty cool. The second bonus feature is the Contract Bonus and the Laptop symbol is the key beginning this feature. There will then be a line-up of suspicious characters displayed and each one has a range of bonuses attached. Simply clicking on one will reveal a reward. There are also free spins up for grabs too with the 18 symbol triggering this feature. There are 18 free spins on offer as well as a 2X multiplier for all wins during this round. Finally, we have the Insignia Bonus which is triggered by the Insignia symbol and if you land at least3 of them then you will be in line for a random coin prize which is great and can really help top up your balance. That’s it for Hitman! It’s a fantastic slot that is packed with features and you can win big playing it on Fruity Casa!